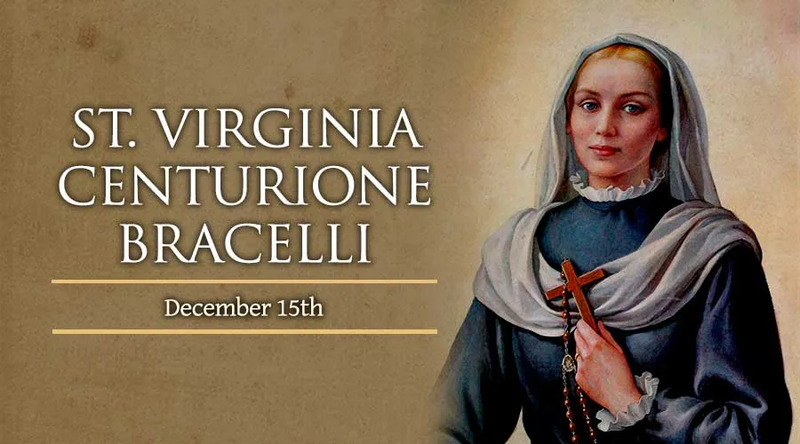 Born in Genoa Italy on April 2, 1587, Virginia was raised in an aristocratic family which was nonetheless pious, and from a young age she longed to consecrate herself to God in the religious life. However, she was pressured into an arranged marriage at the age of 15 on account of her social status, and had two daughters. Her husband, a drinker and gambler, died after only five years of marriage, and Virginia dedicated her time to raising her children, prayer and works of charity, which she devoted herself to entirely once her children had grown up, caring for the sick, elderly and abandoned. She founded a refuge center in Genoa in 1625, which soon became overrun with the needy, and she rented an empty convent in 1631 where she cared for the sick with the help of other women, and she instructed the women in the faith in addition to thier work. She constructed a church dedicated to Our Lady of Refuge, and soon the women who worked with her in the hospital were formed into two congregations: the Sisters of Our Lady of Refuge in Mount Calvary, and the Daughters of Our Lady on Mount Calvary. Victoria retired from the administration of the orders, and performed manual labour and begged for alms, but was called back to administrative duties soon after. She began to receive visions and locutions in the later years of her life. She died in Genoa on December 15, 1651 and was canonized by Pope John Paul II on May 18, 2003.